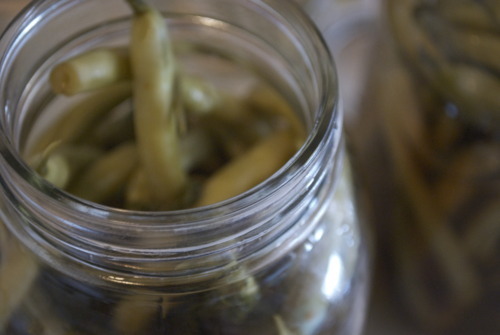 When I was a a kid, maybe six or seven, my Dad , who never cooked, decided to make pickles. This was, to say the least, a surprising idea for him. Or maybe not, his mother made fantastic pickles so perhaps he was feeling nostalgic, but regardless, he decided to make pickles. My dad was a doctor and a scientist, so to say he went about this with determination, precision, and gusto would be like calling Dirty Dancing an alright 80’s dance film. Basically he went a little pickle crazy. A lot of the crazy came from not being able to find dill cucumbers. We went to market after market after market before finally driving an hour or two out side of town to get them at a flea market. The he came home and washed the jars with scientific precision, boiled the brine, did everything according to his mothers recipe. And then we waiting for about a month to finally crack a jar and taste what we were sure to be just like Nona’s, crisp, tart, and slightly herbal tasting pickles. When we finally dug into the jars, they were terrible. They were so salty, and so acidic no one but my dad would eat them, and he did eat them all, being a person morally opposed to throwing out food. I think he even liked them by the end, but there’s a good chance that was for show. I’m telling you this because I want you to know that I have always been intimidating by pickle making. But I recently sucked it up and did it. 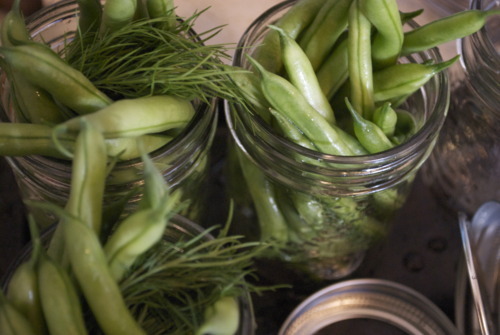 And because I am a big believer in go big or go home I didn’t just make pickles, but also pickled beans, and pickled asparagus. And they were great! They were crispy, they were pleasantly tart, they were flavourful, and downright delicious. And you know where, I think my Nona and Dad are looking down at me pretty proudly. Enough fruit to full 3 litre mason jars, it will depend on how big the fruit is. Wash 3 1L mason jars and lids carefully. Combine all ingredients except the veggies and dill into a pot and on medium high heat bring to a boil, make sure that all the salt has dissolved. Meanwhile, clean your veggies carefully and then pick the stem sides off your beans or cukes, and snap the hard end off asparagus. Put the veggies into the jars making sure that all the ends are below the lip of the jar. Add in your herbs if using. 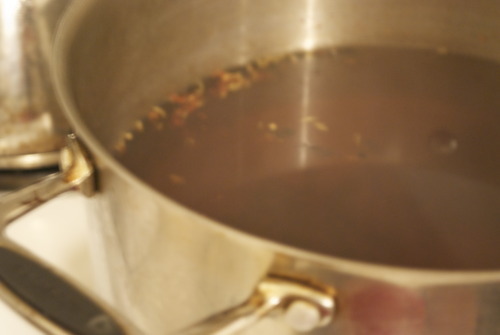 Once your brine has come to a boil pour it into something with a spout like a liquid measuring cup. 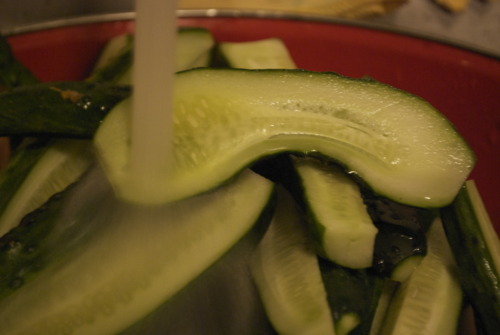 Carefully pour the brine over the vegetables until there is half an inch of space left and all the vegetables are completely submerged. Put the lids on. Put them all on a tray and leave them in the oven for 6 minutes. Remove from the oven and wait to hear the popping noises of happy jars sealed properly! 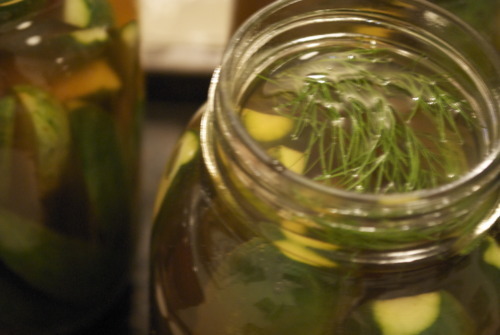 You should wait at least 4 weeks to eat your pickles.